Source: Diabetes Superfoods Cookbook and Meal Planner . Recipe Credit: Cassandra L. Verdi, MPH, RD and Stephanie A. Dunbar, MPH, RD. Photo Credit: Mittera. Mango and other fruit can add a slight sweetness to any salsa. It works particularly well with this slightly spicy salmon dish. Find this recipe and more in The Diabetes Superfoods Cookbook and Meal Planner. To order directly from the American Diabetes Association, click here. Preheat oven to 425 degrees F. Spray a shallow baking pan with cooking spray. In a small bowl, combine chili powder, cumin, garlic powder, cinnamon, and salt. Mix and set aside. Place salmon skin side down in the prepared shallow baking pan, then sprinkle spice mixture evenly over salmon fillets. Place salmon in the oven and cook for 10 minutes or until cooked through. 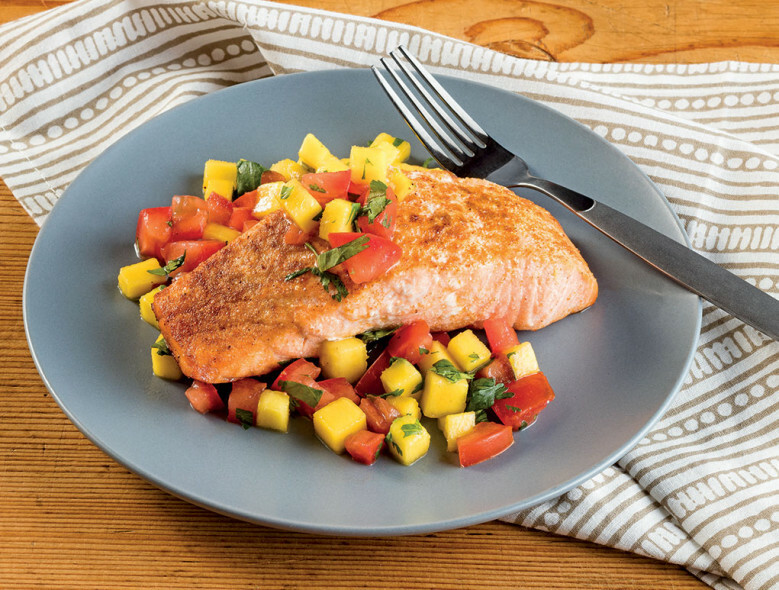 While salmon is cooking, combine mango, tomatoes, cilantro, and half of the lemon juice in a medium bowl. Remove salmon from oven and spritz with remaining lemon juice. Serve each fillet with 1/2 cup salsa.